Young Tristan Thorn has lost his heart to beautiful Victoria Forester. But Victoria is cold and distant - as distant, in fact, as the star she and Tristan see fall from the sky on a crisp October evening. For the coveted prize of Victoria's hand, Tristan vows to retrieve the fallen star and deliver it to his beloved. It is an oath that sends the lovelorn swain over the ancient wall dividing the village from the adjacent meadow, and propels him into a world that is strange beyond imagining. But Tristan is not the only one seeking the heavenly jewel. There are those from whom it promises youth and beauty, the key to a kingdom, and the rejuvenation of dark dormant magics. And a lad compelled by love will have to keep his wits about him to succeed and survive in this secret place where fallen stars come in many guises - and where quests have a way of branching off in unexpected directions, even turning back upon themselves in space and time. 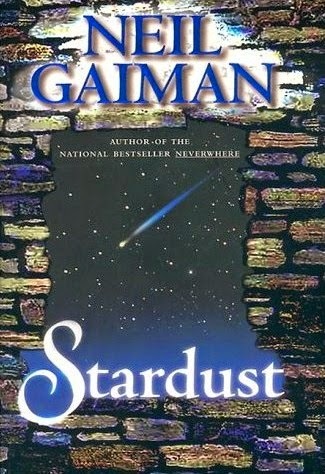 Stardust marks the second Neil Gaiman novel I've read. From the experience of The Ocean at the End of the Lane (and also, to an extent, his Dr Who's episode "The Doctor's Wife"), I knew I had to approach Stardust with an open mind. Stardust is like a faerie tale unlike any I've read before. Yet at the same time, it holds so many faerie tale elements that I recognise that it has an achingly familiar aspect to it. There is the classic story of a boy seeking his fortune for love. There is one of brothers jostling to become a ruler. There are witches. There are spells and curses. There are even cameos from stories that are eerily similar to the tales we grew up with (Jack and the Beanstalk, for example, comes to mind). But everything that we know about these elements are turned, twisted and transformed into something entirely different. This is Neil Gaiman's magic at work. However, I should probably state outright that even though this is a faerie tale, it is not one directed at children. Frequently, as I was reading the book, I couldn't help but compare Stardust to other classic children's tales but really, it's like comparing apples to oranges. It is a faerie tale aimed solely at adults, right down to the ending. Having yet to watch the film, I really can't give any opinions as to which medium is better or how faithful the movie adaptation is to the book. I really enjoyed Stardust, almost as much as I enjoyed the Ocean at the End of the Lane. Though both books are written by Neil Gaiman, they share very little in common. If you haven't tried his works yet, you really should. My tip would be to read them with an open mind. You won't be disappointed. I've seen the movie and read the book. Personally I enjoyed the movie more.